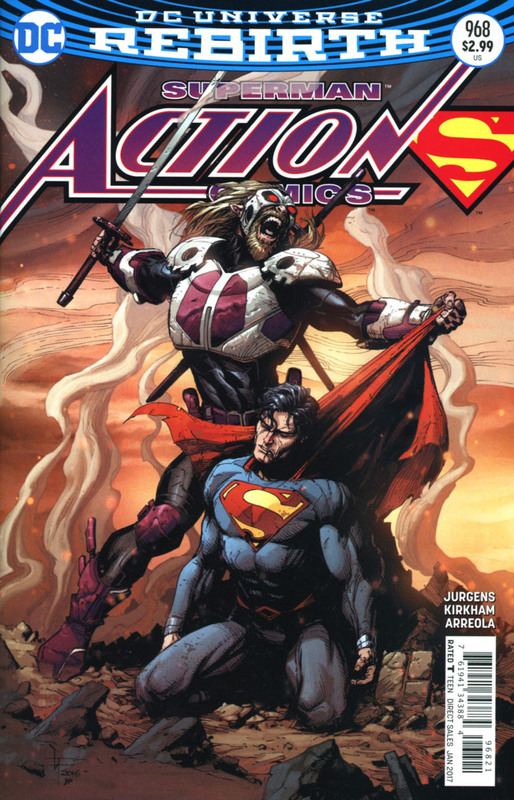 Superman fights with Zade and hopes to keep Jonathan out of the battle as The Godslayer does his best to kill Lex. Lois and the other Clark Kent rush to the roof and provide a momentary distraction which allows Godslayer to hit Lex from behind. Elsewhere Superman's powers are on the frtiz as he continues his battle with Zade. Jonathan provides some assistance in the form of driving a truck into Zade. With Zade down Superman tells Jonathan to stay out of sight as he goes to help Lex and keep Lois from getting hurt. The Godslayer recognizes Superman as a Kryptonian and shows him the future where Lex causes the deaths of millions. After Jonathan calls out from a nearby rooftop Godslayer decides they can't kill Lex here and he and Zade leave with Lex as their captive. Superman and Lois discuss the possible future leading Clark to shockingly suggest that for the good of humanity they should Lex Luthor die. Story - 4: As someone that has dealt with the public his entire working life I can safely say that the first page of this issue was extremely realistic. In fact, I've had days like the chopper pilot where a customer is irate for reasons beyond your control. To be fair Superman has never flown into any of the places I've worked fighting with a guy like Zade but up until that point Jurgens had that scenario down. That scene was a great way to kick off this issue. By choosing to open on a fairly common event Jurgens made the two-page splash of Superman and Zade crashing into the chopper more exciting. It was also funny. Here's a guy complaining that he didn't see Superman and suddenly Superman is there complete with super villain and explosion. The cherry on top was the guy asking for a picture and autograph. It might seem weird to focus on three pages of the issue but I chuckled quite a bit through the entire scene. This was another enjoyable issue. Jurgens continues to balance the action with character and while the matter of Lex Luthor potentially being a mass murdering demigod in the future isn't resolved I don't feel cheated as a reader. This was the sort of Superman story where the main threat wasn't after him directly but he still had to deal with the situation. Jurgens has always been good with these stories and the added complication of Jonathan being there and getting involved made for a dramatic issue. There were some unanswered questions such as how were Zade and Godslayer able to hurt Superman or how they were familiar with Kryptonians but I assume that we'll learn those answers in due time. For the past few issues I've been writing about the bad feeling I've been having about this new Clark Kent. Between the recent solicits and the final page of this issue that bad feeling continues. That final page was very dramatic and a great way to leave us wanting more. It was also the moment where any thought I had that maybe this Clark wasn't a threat disappeared completely. I am looking forward to the resolution to his storyline. All in all, another great issue. Jurgens hasn't dropped the ball yet and ACTION continues to be my favorite of the current Superman titles. Art - 5: Do you like epic shots of Superman? Then this is the issue for you. Not only did Kirkham give us some amazing action scene he also peppered in some amazing Superman panels. To be honest everyone looked good in this issue. Godslayer and Zade were a bit nineties but again that isn't a bad thing with me. I loved the shot of Jonathan on page 5 as well. I wasn't a huge fan of his costume at first but it's grown on me. The art, like the writing, has not let me down during this run of ACTION and Kirkham continues to shine as an artist. Cover Art - 5: At first glance this cover might seem simple in comparison to the previous covers we've been getting. To me it's one of the best. 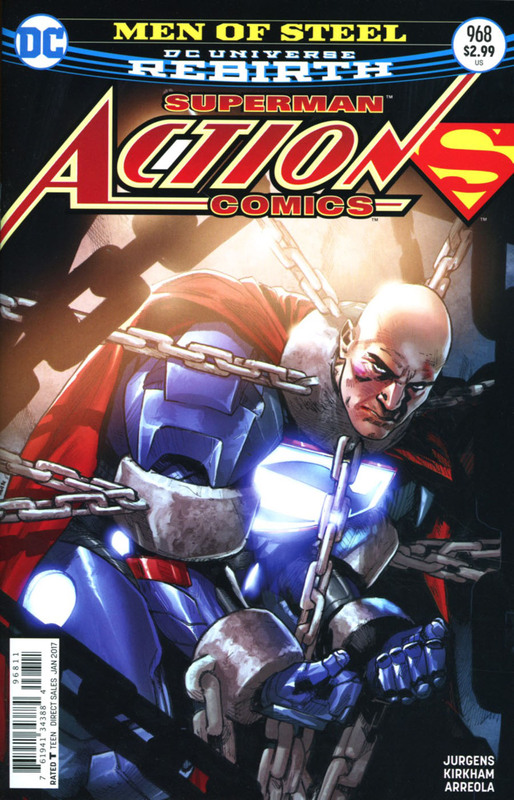 The shot of Lex in chains is striking and his armor looks fantastic. Variant Cover Art - 5: Another great variant cover. Gary Frank's Superman continues to be fantastic and the composition is very dramatic. Part of me wants Godslayer to yell, "THERE CAN BE ONLY ONE!" but that's the Highlander fan in me.